Comfortable Apartment in a Great Location! 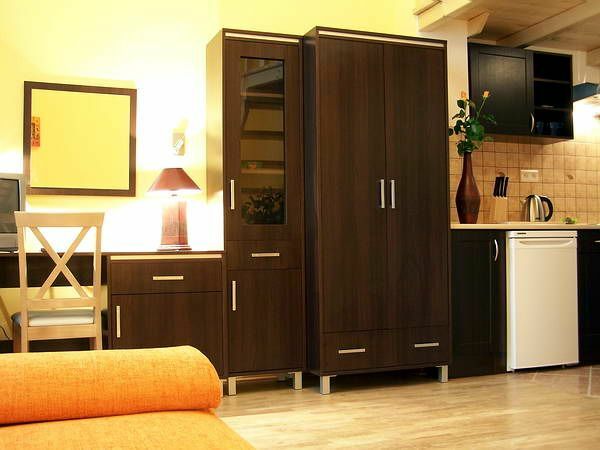 Studio Safona (25 m2, ground floor) The studio is of high standard, for demanding guests. It is located centrally close to the main station, the Market Square and the Kazimierz quarter. It consists of a big room with kitchenette and a bathroom. In the apartment you can find a queen-size sleeper sofa bed in warm colours and a double mattress in the loft. The loft features an interesting arched ceiling. Sorry, no smoking or pets in the apartment. Kitchenette with all utensils, pots/pans, etc. for small meals. My 4 children and I stayed here for 3 nights and it was perfect for us since the younger two wanted to share the bed with me (2 double beds). It was cozy and SUPER close to the beautiful old city center and the train which came directly from the airport! It is a 1 km walk from the train station and less than that to the old town. The apartment felt very safe and comfortable. The kitchen was very minimally outfitted (not even a cloth, can-opener, etc) but did have a stove and fridge so that was ok since we did not plan to cook too much. We took the train from the same station to the salt mines and both trips (airport and mines) are only about 20 minutes and very affordable! I am thankful I did not try to rent a car since parking would have been hard and driving unnecessary. Andrew was super nice to work with and quick to respond. Siamo stati tre giorni a Cracovia e questa casa era perfetta per visitare la città: il centro storico si trova a pochi passi. Il proprietario é stato gentile e disponibile. La casa era pulita ed ordinata. La consiglio caldamente. Rates are subject to change till confirmed. Please note, our calendar is not up to date on this website.